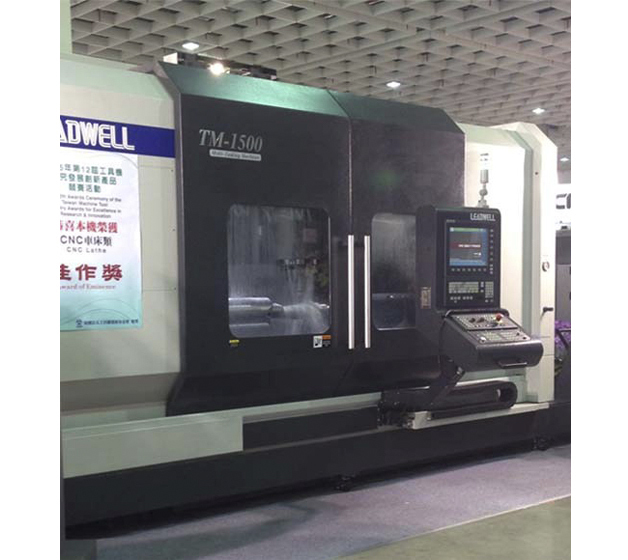 he 12th Awards Ceremony of the Taiwan Machine Tool Industry Awards for Excellence in Research and Innovation or “Award of Eminence” was submitted to Leadwell CNC Machines MFG., Corp. for their CNC Lathe TM 1500. This is a multi-tasking machine that will mill, turn or do both simultaneously and can achieve heavy cutting for the production job shop as well as curved surface milling used in the Aerospace industry. Fagor Automation and Leadwell partnered up nearly 4 years ago and continue to strive for excellence and flexibility toward supplying the end user with the latest technology in today’s ever changing industry. The Fagor 8065 has the capacity to handle the complexity that is required to drive this high level machine at its peak performance level while providing simplicity at your fingertips to operate it. The Leadwell TM-1500 demonstrated the actual machining of a turbine blade used in the Aerospace Industry. It included milling and turning simultaneously utilizing all 5 axes to achieve a 2 machine process. Saving time and increasing productivity with the mill/turn technology has now become a keystone in manufacturing. For your most complex, 5-axes machining needs, the Fagor 8065 is the solution for these applications and more. Pictured to the left is the Leadwell TM-1500 along with its prestigious award seen above.